The KX3 helper non-slip pad tilts your KX3 at an optimum angle for operation. Steve Roberts (W1SFR) has recently informed me about his new website, KX3helper.com where he sells an array of products for QRPers. KX3/KX1 Helper: A foam stand lined with non-slip material to hold the KX3 at a high angle (also other rigs with the controls display on the top surface such as: KX1, HB1-B, TenTec 40/ series, and PFR). QRPad: A foam stand lined with non-slip material for rigs with front-facing controls such as MFJ, OHR, Weber, and Open QRP. 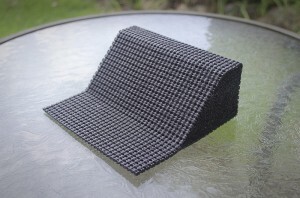 FistRest: Neoprene mat covered with non-slip material to provide support when using keys. EndFed 40-6m Antenna: 31 feet long and made with genuine “Wireman” 18 ga Silky Antenna wire. The 9:1 UnUN weighs 3.92 oz. The Antenna wire and lug weigh 3.12 oz. Total weight about 7.34oz. I’m impressed that Steve tries to source all of his products and materials locally and that his items are quite affordable. Check out Steve’s site by clicking here. Many thanks to Graham (G3ZOD) who also informed me about KX3helper. This entry was posted in Announcements, News, Portable, Product Announcements, Websites and tagged KX3 Helper, KX3helper, Steve Roberts, Steve Roberts W1SFR, W1SFR. Bookmark the permalink.